In the 1970's, my Dad would pile three kids, my mother, and our dog, Susie, on to a 30ft sailboat every summer. 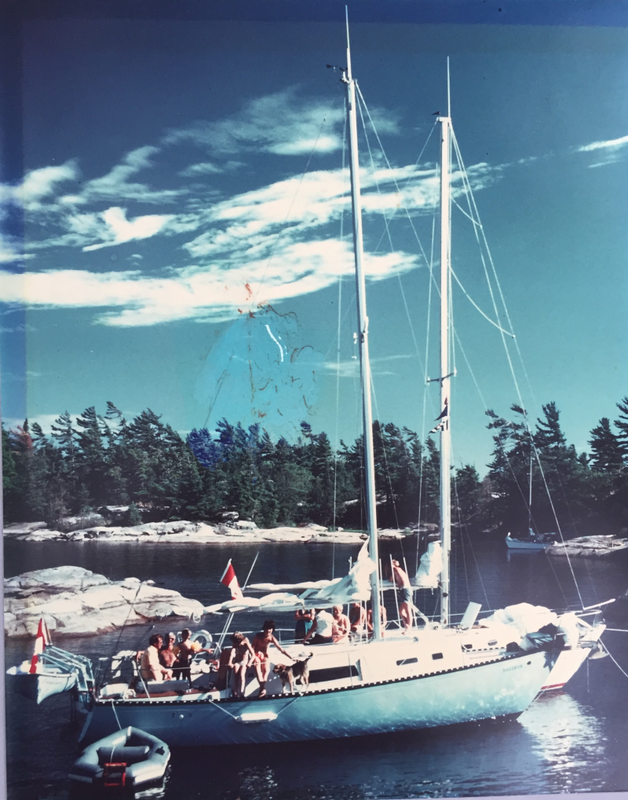 We would sail for 2 weeks around Georgian Bay, landing at different coves and Islands every night. On one island, we picked so many blueberries that my mom was able to make a blueberry cobbler on the boat for dessert! Some passages were very wavy and windy. Our dog, Susie, would sleep in the forward berth while my sister and I played barbies on the bed. One wave was so big, that Susie was lifted into the air about one foot high, before she landed back on the bed, in her same curled up sleeping position. Some coves had multiple small islands around our anchorage. I would make a blow up mattress into a kayak, and paddle to the different islands pretending I was an adventurer, "discovering" each island. Then we would name them. As seen in this photo, sometimes we would run into other families we knew and "raft up" our boats. My dad would grill off the stern of the boat. One time he was poring more propane in the tank, when a leak from the bottle caught fire, he saw the spark and threw the bottle as hard as he could out into the water. It exploded! We were all fine! Those are my memories of Georgian Bay.